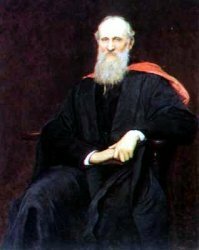 William Thomson was born in College Square East, Belfast on 26 June 1824. 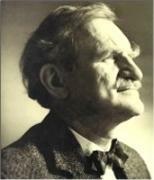 He was educated at Glasgow University from the age of eleven and at Peterhouse, Cambridge. In 1846 he became Professor of Natural Philosophy at Glasgow, a post which he held for fifty-three years. He discovered the second law of thermo-dynamics, but also carried out considerable research on electric currents which was to prove invaluable in submarine telegraphy and accounted for the success of the Atlantic cables. He also devised a more accurate way of determining the size of the earth. He invented depth-sounding apparatus, tide gauges, a new type of ship's compass, and instruments for measuring electricity. In 1866 he was given a knighthood. In 1892 he was created Baron Kelvin of Largs, and in 1902 received the Order of Merit. An exhibition of his inventions in 1896 attended by prominent international scientists was held as part of his fifty years' service as professor. He wrote prolifically and his works are collected as Mathematical and Physical Papers. He died in Scotland on 17 December 1907 and is buried in Westminster Abbey. His statue stands at the entrance of Botanic Gardens, Belfast, and the Kelvin temperature scale is a memorial to his name. The Royal Belfast Academical Institution named its Kelvin House after him.